Going through my gpa's shave gear, I come across these. One is obviously a Colgate, but the other has me stumped. In fact it may not even be shave soap. 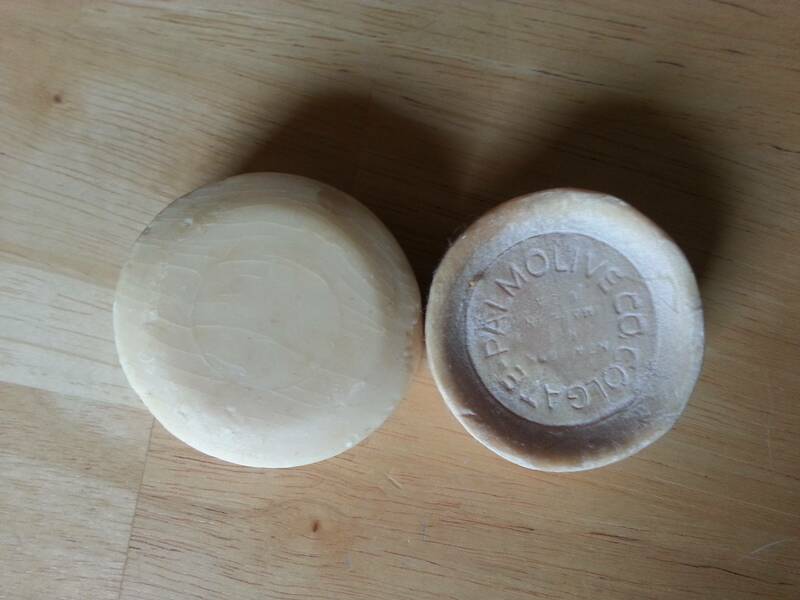 It may even be triple milled as it has a seam that runs the full outer circumference of the soap. Either someone dropped this into one of his shave mugs, or he snagged one of my gma's round soaps to use as shave soap. What you found is this. Oh, and congrats on your B&B ban. I too suffered the same fate. It's a badge of honor. My banning was on 7/23/2018. I was a baaaaaaaaaaaad boooooooooy. (01-28-2019, 07:58 PM)MntnMan62 Wrote: Oh, and congrats on your B&B ban. I too suffered the same fate. It's badge of honor. My banning was on 7/23/2018. I was a baaaaaaaaaaaad boooooooooy. Goodie Two Shoes! What took you so long? I've been banned there for 5 years now. I only joined B&B back in late 2015 or early 2016. Can't remember. It's cool. I found out about 4 other forums that are better. And if I ever want to read reviews about stuff I can still access postings there without signing in. Best of all worlds. perhaps churchilllafemme can chime in. I know he likes a lot of the older soaps out there. (01-28-2019, 10:46 PM)andrewjs18 Wrote: perhaps churchilllafemme can chime in. I know he likes a lot of the older soaps out there. No, sorry, I don't recognize it just from the appearance. You should be able to discern pretty quickly if it is shaving soap by attempting to build lather with it. I'll try. My gpa was sort of a tight wad (as most were in those days) so if it is not Williams, (which it isnt) nor Colgate, I dont think he would have gotten anything fancier. Yardley was out of his league, and MacGregor I dont think came in pucks. He switched to Atra, then electric in the 80s so I dont think it is Stetson. No cologne scent in it either. And assuredly it isnt Old Spice. You don’t think it looks identical to the two pucks shown in the links in my post above? I think MtnMan identified it correctly as Palmolive. (01-29-2019, 02:17 AM)MaxP Wrote: I think MtnMan identified it correctly as Palmolive. Well, actually, Colgate Shaving Mug soap. The picture on the box and the box itself looks strangely similar to the look of Williams Mug Shaving Soap. Probably just the era they both stem from. Same size pucks as well at 1.75 oz. There are a number of listings for the Colgate on that site of the bay. I'd be interested to know how it lathers up and shaves.